Social networking may seem effortlessly instinctive for other businesses, but social media activity often involves rigorous planning, collaboration and scheduling. From daily status updates to sharing a single piece of content across multiple social media channels, there is a lot to do. One tool that keeps your team (and ours) mindful of all there is to do is the editorial calendar. An editorial calendar controls the publication of content, such as blog posts, discussion forum topics, videos, email newsletters, social network status updates and tweets. Public relations specialist uses an editorial calendar to strategically place news stories at the most appropriate times. A business uses an editorial calendar to manage a series of interrelated content pieces. Are you satisfied with your current content creation process? Tell us about it @InflexionTweets. Once a business’s social media team begins to brainstorm, seek out, write, edit, share and respond to a range of content each day, the editorial calendar emerges as not only a viable solution, but a critical step towards ensuring accountability, commitment and ROI measurement. How, then, do you create an editorial calendar for your social media marketing activities? We use Microsoft Excel and Google Calendar to put together our own social media strategy. The spreadsheet gives our social media manager a chance to arrange timelines. Google Calendar helps us keep track of internal digital marketing deadlines and content needs each month. 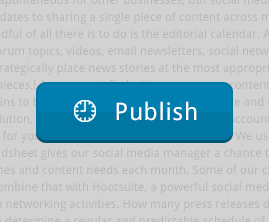 Some of our client businesses use WordPress’s Editorial Calendar plugin to manage social media. Others combine that with Hootsuite, a powerful social media management tool. Start by organizing existing social media networking activities. How many press releases do you distribute each month? How many blog posts do you create each quarter? Use this data to determine a regular and predictable schedule of status updates and tweets that create variety on the networks you use now. Don’t try to do too much at first. Simply plan for regular activity. As you look at your current public relations activities and blogging schedule, you may identify a theme on which to build relevant content. What’s your news? What’s on your blog? Expand those specific stories by joining in on conversations, events and thought leadership. This will help turn a single article into a multi-channel conversation that may outlast the piece itself. An editorial calendar can and should be shared throughout your organization to inspire other departments to deliver data, information and story ideas back to your social media team, giving you a greater number of opportunities to create brand relevant social media marketing content. It takes input from just about every department for social networking to work well longterm. Remember to always be on the lookout for new online engagement tools and business applications on which to build a stronger, more relevant social media presence. If there are any changes to new or existing social networks, your editorial calendar may change, as well. Contact us to talk about how to create your editorial calendar for efficient social networking.